“Sirens,” the debut album from one of my favourite bands of all time, is probably the only album released in 1983, which I actually own on CD. All the others, are either on vinyl or cassette. Plus, my copy is the 2011 remaster which has three really good bonus tracks. 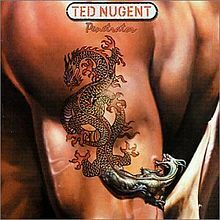 The reason for this is that they didn’t come to my attention until I saw them live in support of Ted Nugent in 1986. I was impressed with their music although I have to admit at the time, Jon Oliva’s vocals that evening didn’t totally bowl me over. However, that was enough to check out their album at the time, “The Power of the Rock” and I liked it. For some reason, I never inquired of any records before that and while I bought all the subsequent albums, I didn’t realize they had albums preexisting Power. Curse me for a fool but now I’ve fully rectified that. Let’s pretend for a moment, I did things properly and bought “Sirens” when I should have. I would have still been totally impressed with this album and the band and would have loved them from that point. If I heard this and their other three albums before I had seen them live, I would have simply assumed that Jon was having a off night and enjoyed their show that much more. That is because “Sirens” has all the qualities which have made me a mad ‘Tage follower. One problem I have discovered from listening to a CD in the car is that driving distracts you from properly listening to the album. I have always liked it when I listened while driving but I often missed the intricate little details that Savatage put in their songs and only now that I am listening it in the house, do I fully appreciate how good it is. Every song on the track radiates classic Savatage from the almost mysterious opener, “Sirens,” to the closer, “Out in the Streets.” Each song has it’s own identity while reminding you who’s singing and playing the song. If I have to pick favourites, it has to be “Scream Murder,” which barely beats out the closer. For all my lack of impression of Jon’s vocals when I saw ‘Tage that evening in July, 1986, he sounds fine on “Sirens.” Even that shriek he is more famous for on “Hall of the Mountain King” is done very nicely on the title track here. He sound even more mental (in a good way) on “Rage.” Therefore, while even the hardest Savatage fan, if that’s not me, knows that Jon’s vocal ability is limited, he does very well with what he has here. As for brother Criss, his best guitar solos are on the last two tracks, probably why they’re my favourite, he does some really catchy hooks throughout the album. His solo on “I Believe” is quite good too. While the brothers Oliva show their stuff here, the rhythm section of Steve Wacholz on bass and Keith Collins on drums do their part in making this album so good. Hearing the album as I have the past few days, I think it knocks “Handful of Rain” off the number five spot on my list of favourite Savatage albums. 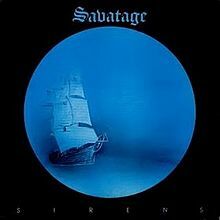 Savatage’s debut album might have escaped my notice in 1983 but I did eventually get to listen to it. I slightly regret not getting “Sirens” then as it would have been the beginning of my loyal devotion to this band. 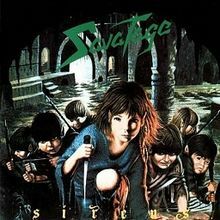 However, no use fretting because even though it is such a great album, Savatage would go onto to bigger and better things. Still, what a great springboard to launch from.